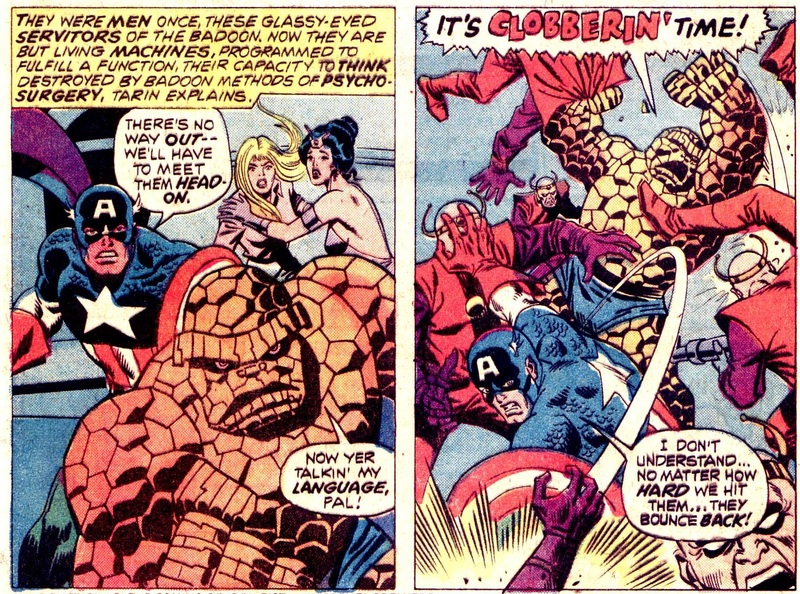 The Second look into the Guardian’s world was in July 1974’s Marvel Two-in-One#4. On Sale in April 1974 it shared the newsstand with Amazing Spider-Man #134, Captain Marvel #33, Flash #228, Justice League of America # 112, The Mighty Thor #225 and World’s Finest #224. Marvel Two-in-One was a team up book, that often had more unusual stories or guest stars than Marvel Team Up and was the better for it. 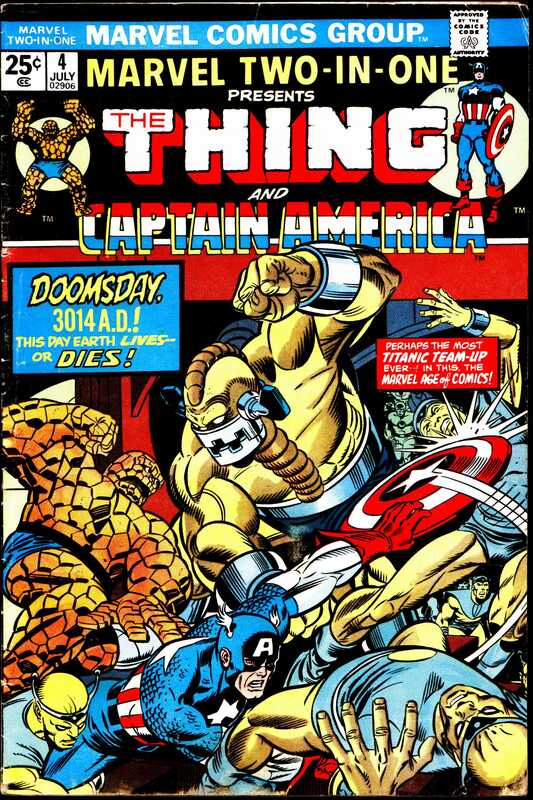 Marvel Two-in-One 4 was written by Steve Gerber, was pencilled by Sal Buscema and inked by Frank Giacoia and the story was titled Doomsday 3014. 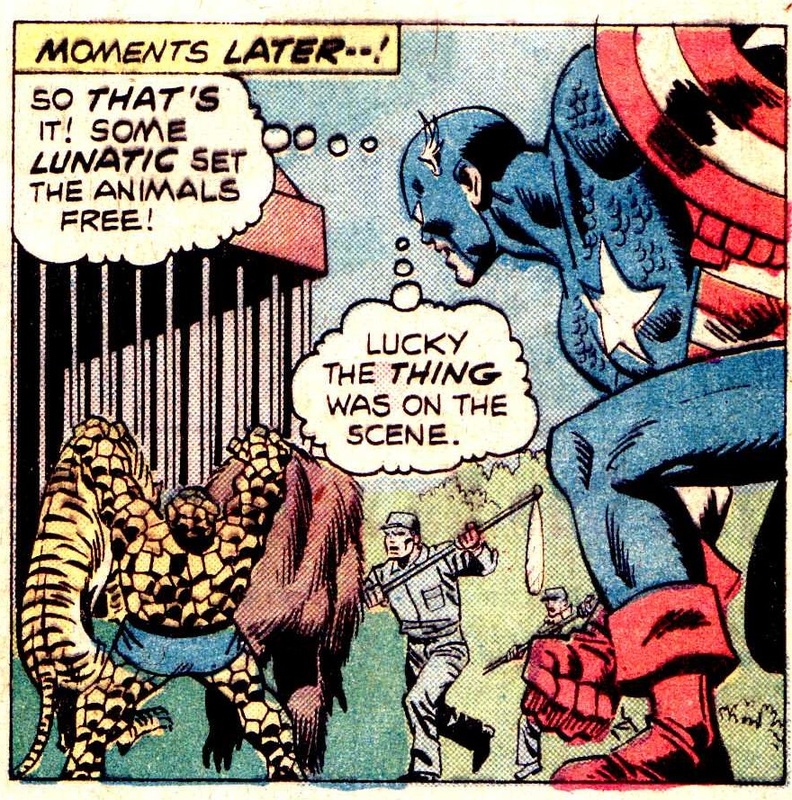 The story opens with the star of Marvel Two-in-One, the Fantastic Four’s Ben Grimim, the ever lovin’ blue eyed Thing walking through central park zoo with Wundarr, who had appeared in the title in earlier issues. Wundarr was a full grown man with great strength, but was isolated from birth and as a result had a very childlike demeanour and outlook. Asking “Unca Benjee” to get him some candy floss/cotton candy, he tears open the cages in the zoo and lets out several wild animals. The Thing then corrals the animals and tries to calm the situation down. 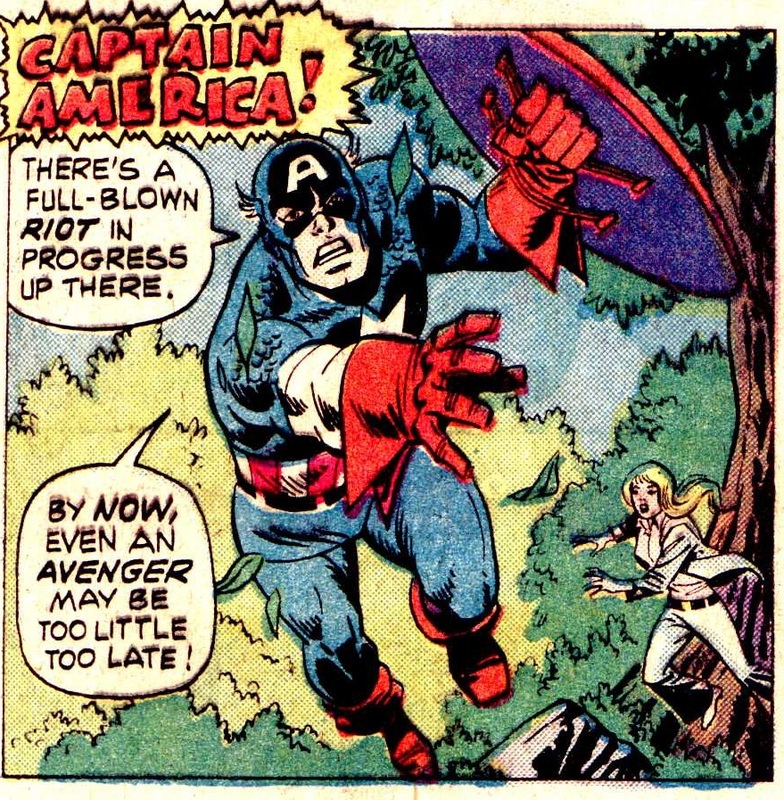 Whilst this is happening, nearby Captain America (in his guise as Steven Rogers) is talking a walk with Sharon Carter (Agent 13 of S.H.I.E.L.D) when he hears the fracas. Quickly he dons his Cap outfit and rushes to help, seeing that Ben has it all under control he turns back in time to see a robbery taking place and takes on the three thieves in a battle that takes a page, but really only lasts a couple of seconds. When this melee comes to an end, a tearful Wundarr is found by Namorita ‘Nita’ Prentiss, the cousin of Namor, the Submariner and her roommate Amy. Wundarr knows Nita and when she suggests to Ben that she take Wundarr in and tutor him all parties agree. Then Cap and Ben along with Sharon walk off together to the Fantastic Four’s headquarters in the Baxter Building, for reasons that are never made very clear. Back at the building, Reed Richards and Madame Medusa are repairing Dr Doom’s time platform and by accident Ben switches it on. As the five are getting some coffee together, the machine brings a woman from the future on the platform. She wanders around and sees the world of 1974 and panics at the sight of people and places gone for a thousand years. After an exposition dump about the Badoon conquering Earth in 3007 and the Guardians of the Galaxy leading the resistance Cap and Ben along with Sharon agree to go back with the woman who’s name is Tarin. 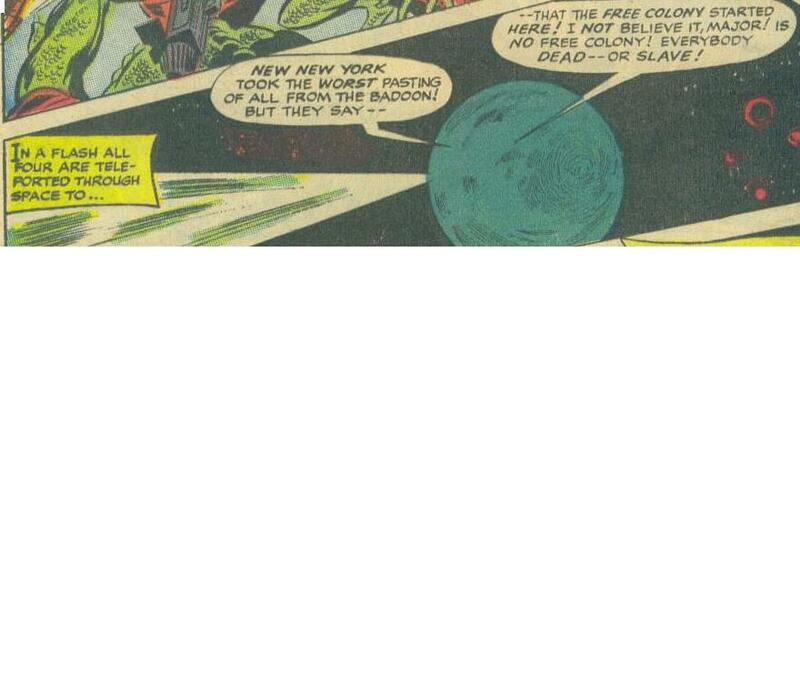 Arriving in 31st Century New York, they are immediately set upon by Zombie patrols and the monster of the Badoon. After a strong showing, they are defeating and carried away, all but Tarin who realises she has been overlooked and the Badoon will pay for that mistake. Marvel Super-heroes 18 was relased on October 15 1968 and shared spinner rack space with such comics as; Atom & Hawkman # 40, Nick Fury: Agent of S.H.I.E.L.D #8, Secret Six # 5 Avengers #59, Flash #184, Captain Marvel#9 and Green Lantern #65. The Guardians of the Galaxy was the cover story. It was written by Arnold Drake, pencilled by Gene Colan, inked by Mickey Demeo and lettered by Herb Cooper. It starts in the year 3007 with a soldier returning from deep space patrol to find his home-world deserted and his people gone. He soon finds the Badoon, a race of reptilian conquerors, have reached his home Jupiter. The solider is Charlie-27 one of a race decended from human beings of Earth who have been genetically modified to live on Jupiter who have eleven times the cellular density of a regular human, making them incredibly strong and resilient. 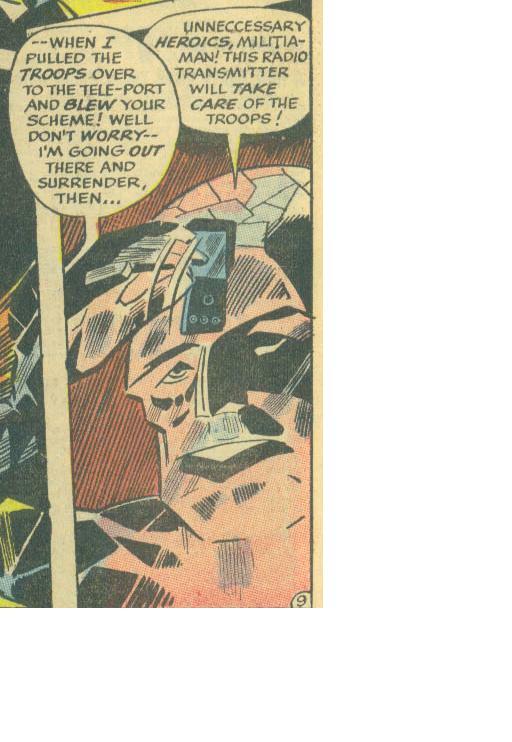 He dispatches the two Badoon who find him and he decides to use a tele-port station to get whatever help he can. He teleports away without setting a destination and he finds himself on Pluto. Once there, Charlie-27 avoids another pair of Badoon who seem to be taking their pets to a pool party as they’re already wearing their purple speedos. Before they can locate him, he is pulled inside by a crystallin hand. It belongs to Martinex and pluvian, also a decendant of earthmen his race has been engineered to survive in freezing cold and darkness with crystal skin and eyes that don’t seem to require light to see. There’s a moment of tension as it’s shown than Jovians and Pluvians don’t get on too well with Pluvians being called rock-heads by the more human looking Jovians. 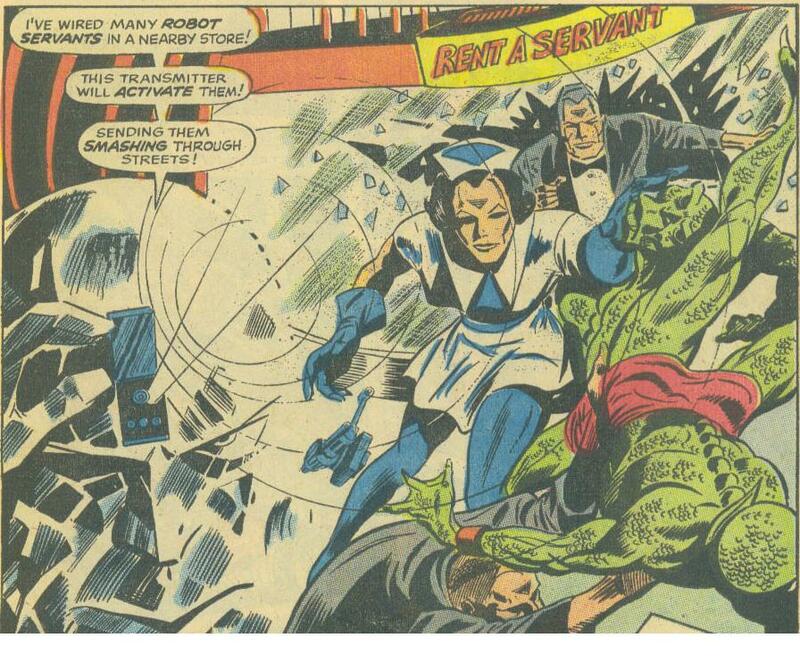 Martinex creates a distubance by sending robot maids and butlers after the Badoon, so that they can both flee to earth which they both hope is still free. In a sort of throne room, the local commander, Drang has had two prisoners brought before him. One prisoner is a blue humanoid with a red crest-like mohican and the other a human dressed in a purple bodysuit covering every part of him. The body suited man is Vance Astro, an astronaut from the 20th Century who was sent on a thousand year journey to the Centauri system, his body forever wrapped in the foil bodysuit which keeps him alive. The only problem is that 200 years after he left, a scientist called Harkov cracked faster than light travel and there were human beings waiting for him, making his journey and sacrifice rather pointless. 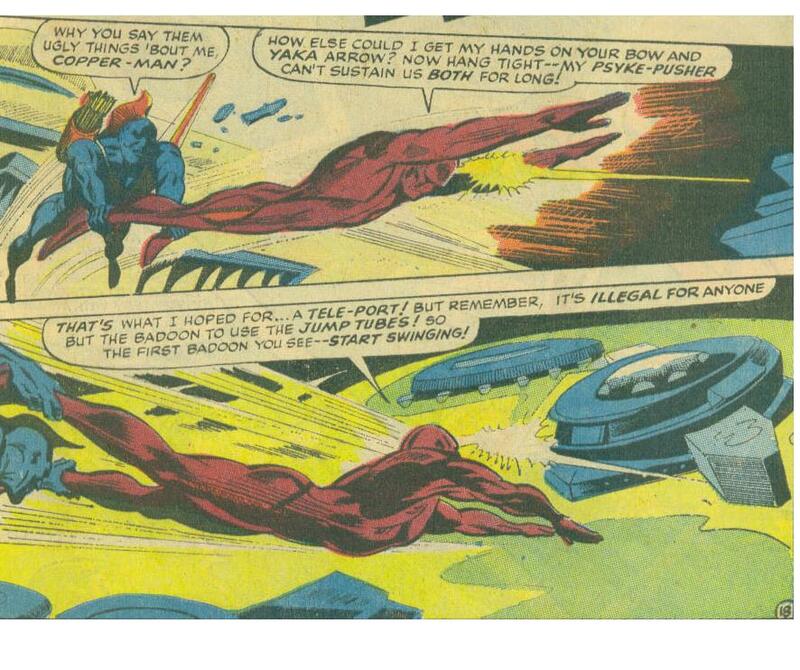 After being forced by the Badoon to relive this experience he convinces Drang to let him shoot the other prisoner, Yondu who was a native of Centauri with his own bow and arrow. As he fires, Yondu whistles and the arrow changes direction and hits a nearby Badoon. Using this distraction Vance and Yondu jump out of the nearest window and using Vance’s psycho kinetic power glide safely towards the teleport station just as Martinex and Charlie-27 arrive. After a brief patented marvel misunderstanding fight they realise their all amongst the last of their respective kinds and vow to find a free colony of humanity and take the war to the Badoon and liberate the Earth. A fine story for it’s time with a different look to Gene Colan’s art. It does raise a few interesting questions. 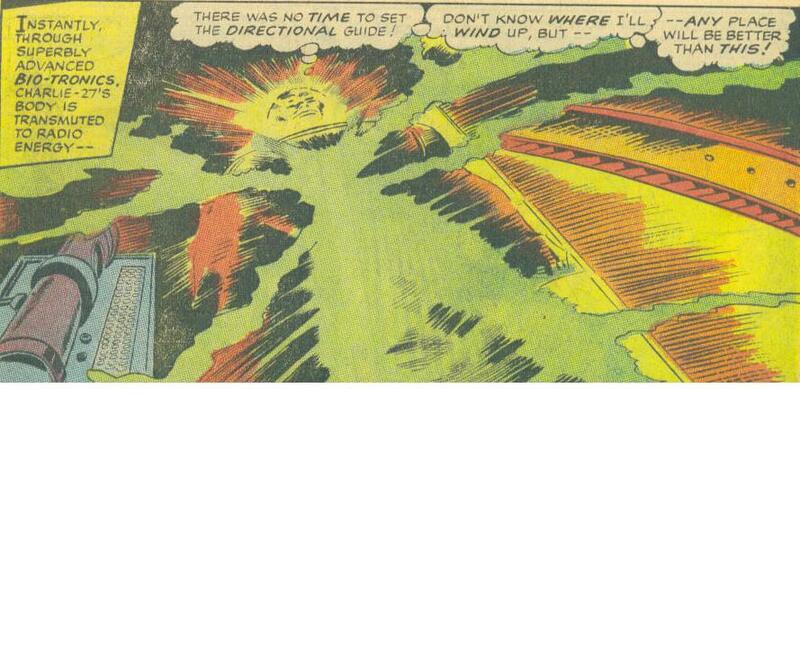 1: How did the Badoon conquer two solar systems when you never see any more than two at once? 2: Why were the robots dressed up as maids and butlers? 3: Why does Martinex have a remote control built into his forehead? Are there no pockets on Pluto? 4: Where exactly is New New York? This is a bare bones origin story which launched the Guardians of the Galaxy concept, but many of the more familiar elements and characters don’t come in for a while yet. The best is yet to come, but not for aut 6 years. 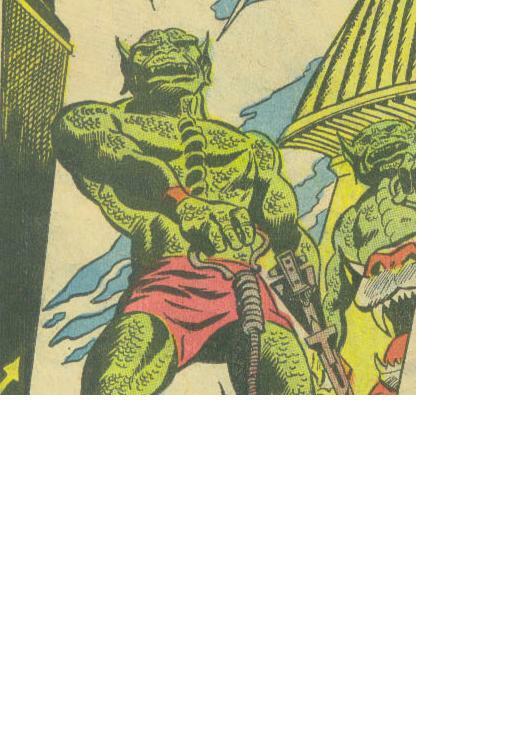 In the beginning there was the Badoon. I decided to do an issue by issue look at the Guardians of the Galaxy. Starting with their first appearance and on until either real life or a better idea get in the way. Some of you will know some of these comics, some of you won’t and herein lies the fun. 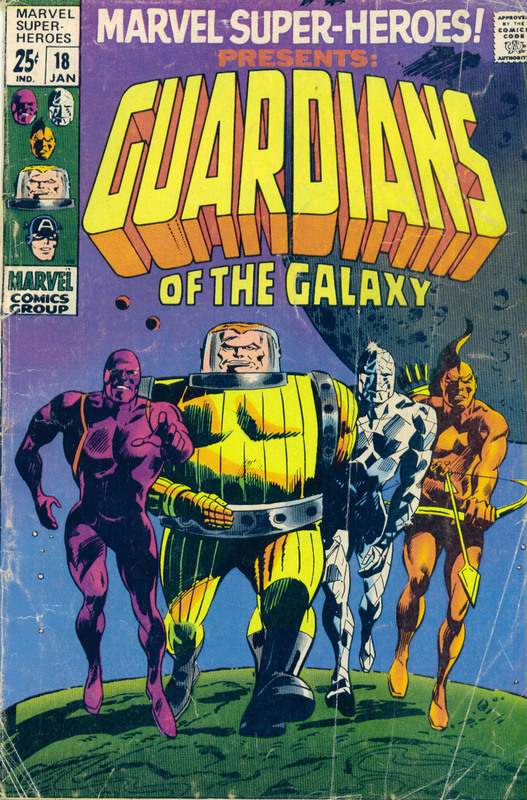 The Guardians first appeared in Marvel Superheroes 18 in 1968 in a short opening story of the comic which was an anthology. They next appeared in a number of guest spots in other titles from 1974 until 1980 and then got their own title in 1990. I first noticed this title at issue 2 and 3 and then collected it religiously until it’s cancellation at issue 62 in 1995. This was one of the more obscure titles of the time and often mentioned or looked back on. But for me these future Avengers (if you look, there do have analogues to the Avengers, there’s the man out of time, the huge fighter, an archer and the scientist/engineer, even the second set of members had a character with parallels to the vision) with their outer space adventures seemed so much fun. So when I was thinking about doing a blog, I was reminded of the advice write what you know and the Guardians just came to mind. So here’s how it’s going to go, whenever I get the chance I will review and discuss an issue in which the Guardian’s of the Galaxy appear, in order of appearance. I hope you bear with me, because I am making this ‘stuff’ up as I go along, any comments, critiques or dirty jokes are appreciated. My subject is after the X-Men one of my all time favourite comic properties. I found them at a shop at the top of the road, when I was in my mid-teens. I fell in love with this mix of Super-Heroics and Space Opera. With the new Guardians of the Galaxy getting their movie debut this year, I wanted to take a look at the originals before they’re completely forgotten.